No Group in the history of gospel music produced more stars than Alberta Walker's Caravans. Among those who passed through the Chicago-based ensembles ranks during the '50s and '60s were Bessie Griffin. James Cleveland, Cassietta George, Inez Andrews, Dorothy Norwood. Shirley Caesar, and Loleatta Holloway. All, including Walker herself, went on to become important (and in several cases, major) solo gospel artists, with the exception of Holloway. now a dance music diva. The Caravans were organized in 1952 by Chicago native Albertina Walker and other former members of the Robert Anderson Singers. The group recorded for the local States label between 1952 and 1956, during which time Griffin, Cleveland (Walker's childhood friend) and Norwood were members. By 1958, they had moved to Gospel, a subsidiary of Savoy Records, where their lineup included the statuesque shrieker Andrews and the diminutive firebrand Caesar. With this unbeatable combination, guaranteed to devastate audiences, the Caravans became the most popular female group in gospel. 'The great thing about the Caravans was their teamwork,' Anthony Heilbut commented in his essential book, The Gospel Sound: Good News and Bad News (Limelight Editions, 1985) . 'They knew each other so intimately that they could easily predict each other's improvisations...The Caravans were the hippest ladies in gospel.' The group recorded five albums for Vee-Jay between 1962 and 1965. 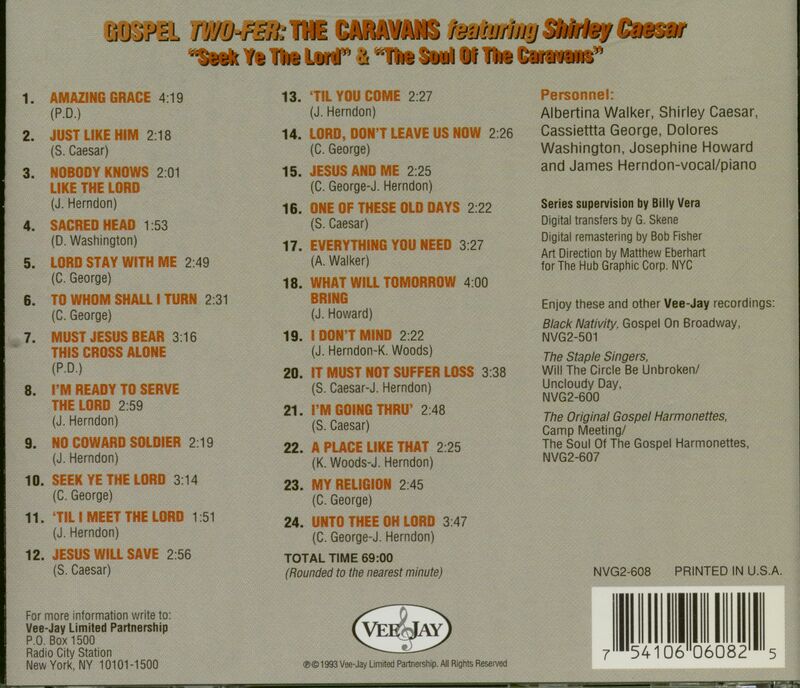 The two coupled on this compact disc-1962's Seek Ye The Lord and 1963's The Soul of the Caravans—were their first for the company. Personnel was consistent during their Vee Jay period: Walker, Caesar, George, Dolores Washington, Josephine Howard and pianist James Herndon. The program begins, not with the group, but with five solo performances by leader Walker. 'This,' she explained at the time, 'is in answer to the many people who have asked me why I didn't sing solo more often on our recordings.' A commanding contralto, Walker is also featured on tracks 6, 13, 17, and 19, all with fervent backing by the rest of the group. James Herndon. the group's pianist from 1962 to 1967, is featured on track 7, reprising the role of monologist previously assigned to Cleveland. Semi-operatic soprano Washington, a member from 1958 through 1967, makes a rather rare appearance as a soloist on tracks 10 and 24. as does the bluesy alto Howard, a member from 1962 to 1967 (and mother of current soul star Miki Howard), on track 18. The remainder of the selections are given over to the Caravans' two star soloists of the Vee Jay period: Caesar and George. Born in Durham, North Carolina, Caesar began her career as a child, billed as: 'Baby Shirley,' under which name she recorded for Federal in 1951. One of the most intense gospel performers of all time —'The energy transmitted between her and her audience makes most rock 'n' roll fanaticism seem like empty piety,' James Kelton observed in a 1977 San Francisco Examiner review she sang with the Caravans from 1958 through 1966 and is featured here on tracks 9, 12, 15, 16, 20, 21 and 22. Memphian George, whose down-home, yet elegant style betrays her roots in a female quartet, provides somewhat subdued contrast to Caesar. A member in 1954 and '55 and again from around 1960 to 1965, George leads on tracks 8, 11, 14, and 23. 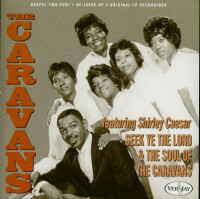 When Caesar left the fold in 1966 to pursue evangelism and a solo recording career soon becoming the leading female vocalist in gospel, the Caravans lost their main drawing card. Within a matter of months, the others quit too. Walker formed another edition of the group (featuring Holloway), but it lasted only a few years. On occasion, however, Walker still calls together the old members for reunion concerts to recapture the spirit of the Caravans' glory years, of which these Vee Jay recordings represent an essential part. Customer evaluation for "Seek Ye The Lord - Soul Of The Caravans (CD)"